Eighteen journalists have been killed in the last 42 days. 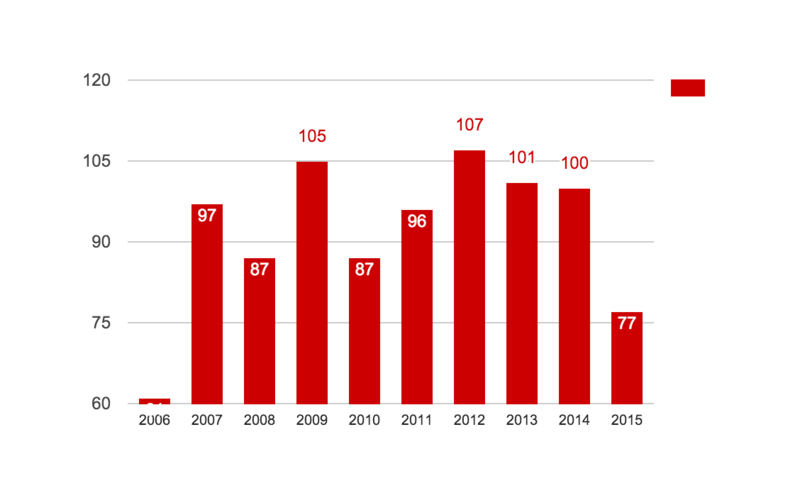 If this rate continues, 2016 could be the worst in a decade for journalist fatalities. The global well-being of journalists is monitored by sources such as Reporters Without Borders, Committee to Protect Journalists and Canadian Journalists for Free Expression (“CJFE”). Data from the Canadian Journalists for Free Expression covers journalists killed in the field from 1996 to present. In the map above you can see a topographical representation of deaths. More rings in one location means recurrent deaths year after year in that country. Smaller rings are older years. Bigger rings are more recent years. Seven of the 14 reporters killed in January died in a suicide bombing in Kabul, Afghanistan’s capital city, on Jan. 20 that killed seven employees of the Afghan TV station, Tolo TV and injured 26 other staff members. The Taliban said they targeted members of Tolo TV specifically, saying the network produced propaganda. A little over a week later, Hajji Mohammad Zubair Khaksar, a correspondent for Nangarhar TV and Radio network was killed just east of Kabul. In comparison, in 2015 Syria was the deadliest country for journalists with seven journalists killed throughout the whole year. Last August, Mexico City issued a law to help protect journalists. However, the three journalists killed in Mexico this year were all in Veracruz, which is largely regarded as one of the most dangerous places to be a journalist in Mexico.